From Minnie: After years of not eating asparagus at all, we now love it, and are always on the lookout for new ways to make it. This is such an easy and elegant way to serve it. The asparagus gets a slightly nutty flavor after roasting, which makes it even more delicious! The asparagus gets a slightly nutty flavor after roasting, which makes it even more delicious! 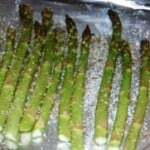 Break off the woody bottom part of the asparagus spears and save in freezer for soups. 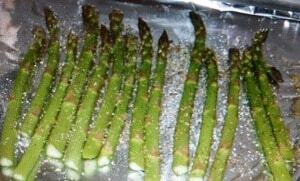 Place asparagus on foil-lined baking sheet and drizzle with olive oil. Sprinkle with salt, pepper, and garlic. With your hands, roll the asparagus around until they are all evenly coated with the oil and seasonings. Roast for 12-15 minutes, depending on the thickness of your stalks and how tender you like them. A sharp knife tip should easily pierce the stalks when tender. The tips of the spears may get very brown but watch them to prevent burning.